In the third quarter (ending September 30th), coin demand went through the roof. Mints literally couldn't keep up with demand. The dysfunctional U.S. Mint rationed deliveries of Silver Eagles, failing to fulfill its mandate under law of keeping the market supplied. Even so, investors bought up a record 18.59 million ounces' worth of silver Eagle coins in the past 4 months. 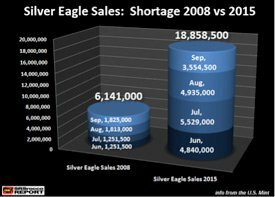 Steve St. Angelo of SRSRoccoReport.com compared the 2015 Silver Eagles shortage situation with the infamous 2008 incident. He found the current shortage occurred even as the U.S. Mint produced three times as many Eagles this time around! Extraordinary conditions in the silver market are causing the mainstream media to sit up and take notice. Record demand for silver coins has driven premiums on virtually all bullion products substantially higher. Some of the biggest premium spikes are being seen on pre-1965 90% junk silver coins. These premium increases represent real gains in value for holders of physical silver. During periods of elevated premiums, national dealers such as Money Metals Exchange have and will pay prices up to several dollars above spot on buy-backs of most silver products from customers. Market conditions will eventually normalize. But since this great public buying spree in physical silver was spurred by low spot prices, it may take significantly higher spot prices to lessen demand-driven shortages and backlogs. Buyers who wait for premiums to come down may, in turn, end up having to pay higher spot prices. Market tightness is less of a problem for gold bullion products. For the most part, supply is keeping up with demand. That's not to say that gold bullion hasn't experienced a demand surge of its own. It definitely has. Sales of gold American Eagles surged to 397,000 ounces in the third quarter, up from 127,000 ounces for Q2. When Will the Physical Bull Market Kick Off a Bull Market in Prices? Will Q4 produce more explosive demand figures for gold and silver bullion? It's possible. 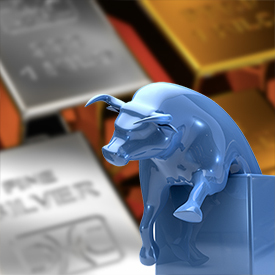 In the meantime, bullion investors will be looking for evidence that the bull market on the physical side is stimulating a bull market in the spot prices set by highly leveraged futures exchanges. The price action in gold and silver futures so far this year has been disappointing - and, frankly, baffling from a fundamental standpoint. Metals prices shouldn't be falling given what's going on in the world. Central banks across the globe are desperately trying to stimulate weak economies. A worried Federal Reserve backed off on purported plans to raise rates. Although industrial demand for silver is down, so is mine production (as discussed more fully below). The falling supply and through-the-roof investment demand for physical gold and silver are more than enough to pick up the slack. Unfortunately, while fundamentals matter to investors, they don't matter to the traders and the large financial institutions that have cornered the gold and silver futures markets where paper metal is in ample supply. Several big banks hold outsized short positions on precious metals. The trade has worked out well for them lately, and that's all they care about. Shorting precious metals won't be profitable forever. When the market for gold, silver, or any commodity gets depressed in price for an extended period, the forces of supply and demand start pressuring prices back up. The pressure may build for months before it starts showing up on the price charts. But eventually, something will break. Artificially low prices encourage increased consumption and discourage production – a veritable recipe for higher prices at some point down the road. To be sure, low prices for gold and silver have absolutely decimated the mining industry. That means that supplies in the months and years ahead are headed for a decline that will not be easily reversed. 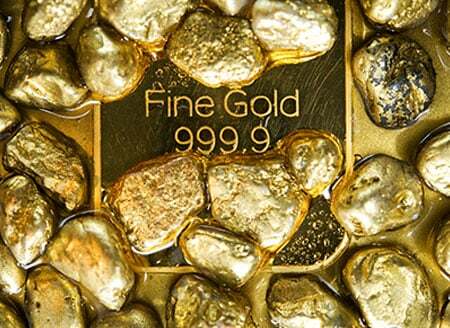 These fundamental supply and demand forces will make for higher precious metals prices – perhaps starting in the final three months of 2015; perhaps not until a bit further out on the calendar. Long-term investors should leave the short-term market timing to day traders. When the stealth bull market in precious metals shifts into a full-fledged bull market on the charts, those who hang on for the ride will do better than most of those who try to trade in and out. And those who own physical precious metals will have more security, and more ways to profit, than those who hold paper contracts.